I must make it clear from the outset that I am not on anyone’s ‘side’ in this debate. My concern is solely with the health, welfare and quality of the dogs. Some pictures came my way a few weeks ago which I would like to share with you. It caught my eye because of a column I wrote a couple of months ago about German Shepherd Dogs which led to some discussion with GSD enthusiasts. The correspondence I received at the time demonstrated, in spades, the points I was making recently in another context about closed minds. I was sent an outline of the skeleton of a GSD, the one reproduced here, and told that it was accepted by breeders in Germany and throughout the world as the ‘ideal’. My view is that although exaggerated it was well within the parameters which I have outlined in these articles about conformation and soundness in the past so it was fine by me. If you examine the drawing, you can see that it represents a relatively normal conformation. The second thigh is somewhat over long and the angles in the hind quarter are significantly at variance with those in the forehand (the expectation in a ‘normal’ construction is that they would be very similar) but nevertheless the structure is acceptable. I was then directed to the picture of a dog and told that it had won a sheaf of awards – and that it typified the conformation demonstrated in the drawing of the skeleton. This is the one. Here my correspondent and I part company. Imagine the photograph overlaid on the skeleton. Does it fit? No it does not – not by any stretch of the imagination. We are often told in no uncertain terms that we should look to Germany for our inspiration and I am therefore delighted to bring you a third illustration which was taken in Germany prior to 1957 (it must have been before 1957 as this picture was when the book was published in a German book on dogs breeds). The book is fascinating and has many lovely monochrome pictures showing quite clearly that many indigenous German breeds in the ring today including Rottweilers and Dobermanns, look very similar to those being shown fifty years ago. As you can see, an exception is the German Shepherd Dog. This picture shows a judges training session at a German show. You can see that the skeleton on the blackboard that the ‘live model, black German Shepherd would fit neatly over it. 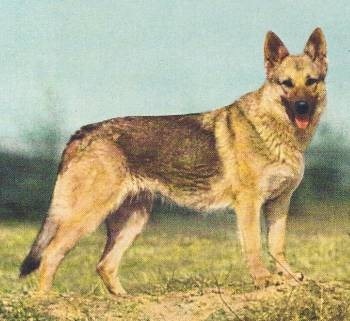 My question is a simple one – why is there so much attention being paid to the modern German Shepherd Dogs from Germany when they are so very different to the type and conformation of those which were considered ideal in the 1950s? Pictures from the books in my own library from the 1950s show UK dogs very similar to the black dog here. They were taken in the late 1940s I think, before the British fashion for long backed, low to ground GSDs became prevalent, a style which provoked firstly a reaction to and then the establishment of, the ‘real’ GSDs from Germany which gave us our current ‘Germanic’ type. 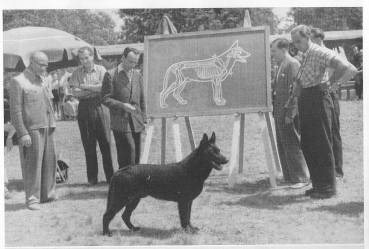 The problem appears to me not to have been with UK breeders but German breeders who were getting away from what was the ideal shape and conformation demonstrated by the dog in the seminar photograph. 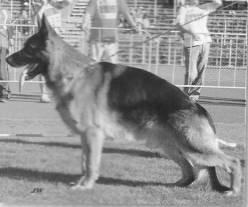 Fortunately, there are still many breeders of ‘balanced’ and not ‘extreme’ German Shepherds and so ‘on the street’ and occasionally in the ring, you do see sound GDSs that have not been designed to pull against the lead when gaiting. What is such a shame is that we have already seen a significant reduction in the numbers of the breed shown in recent years as breeders of the two ‘styles’ have become locked into a battle which has ego at its heart rather than the dog (though to be fair this is not very different to many breeds and breed clubs). I wonder how long it will be before sales of GSD puppies are seriously affected. This may provide more of a stimulus than pressure from the Kennel Club to put breeders back on track. Finally, here is another picture from the same book. My German is negligible but I understand the caption indicates that this dog is considered ‘a superb example of the breed’. I submit that the breeders in Germany are those ones who have ‘got it wrong’ and that many of those in the UK have slavishly followed their lead without thinking the consequences through. You are currently browsing the David Cavill's Weblog weblog archives for January 2010.